On the Holy Mountain, we are taught that everything in a saint’s life is worthy of admiration, but not everything in a saint’s life is worthy of imitation. This is certainly true, yet to this rule the lives of the Three Hierarchs are an exception: everything about them is both admirable and worthy of imitation. 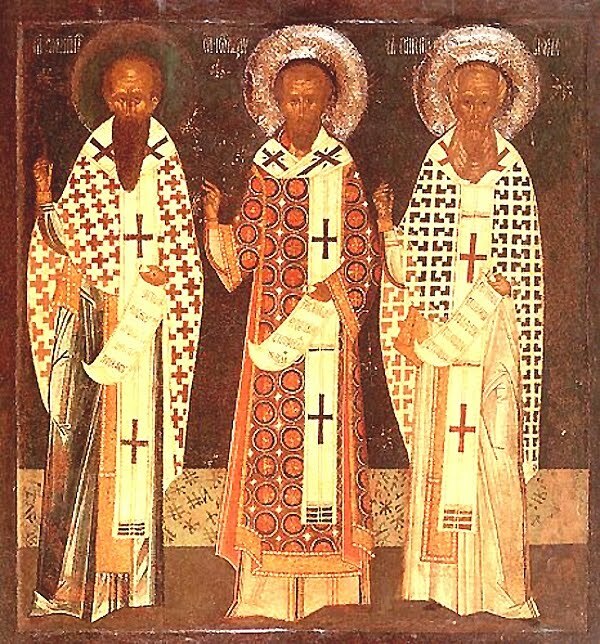 Tonight I want to look at the Three Hierarchs in light of the remarkable experiences that changed the course of their lives and transformed them into great teachers, fathers, and saints. As we shall see, each of the three underwent a crisis, a decisive turning point, that led to spiritual transformation. As I hope to show, these critical experiences, which were essentially conversion experiences, are the key to understanding who they were and what their lives can mean for us today. Having wasted much time on frivolous things, and having sacrificed virtually my entire youth to study the teachings of a wisdom that God had made foolish (cf. 1 Cor 1:20), I woke up, as if from a deep sleep, and beheld the wondrous light of the truth of the Gospel, and I recognized the uselessness of the wisdom “of the princes of this world, whose rule was doomed” (1 Cor 2:6). Shedding a flood of tears over my wretched life, I prayed for a guide who might form in me the principles of piety. Above all, my concern was to make some amendment in my character, which had been corrupted by long association with people of low morals (cf. 1 Cor 15:33). Having read the Gospel, I saw that a great means to attaining perfection was the selling of one’s possessions (cf. Mt 19:21), and the sharing of one’s wealth with those in need; along with the refusal to take any thought for this present life, so that the soul should not be attached to the things of the world; and I prayed that I might find someone who had taken this path, so that with him I could cross the deep and troubled sea of life. Simply put, Basil saw the light; the wondrous light of the truth of the Gospel, and his life would never again be the same. This was a transforming event, a change in consciousness, like waking up from a deep sleep after a long, disorienting dream. It was a movement from darkness to light, from the reflected, dead light of human logic to the splendor of the truth itself. Moreover, Basil’s call to a new life did not create in him a self-affirming rush to action, but rather the desire, the need, for a guide, a teacher, a longing to find someone who was already on the path, which is a longing for a new mode of relation, and a new kind of community. In placing emphasis on Basil’s vision of divine light, we must not forget that this experience was preceded and indeed precipitated by a crisis. Before the light there was darkness, before waking there was a deep sleep, and before vision there was spiritual blindness. And what are darkness and night and sleep if not the symbolic counterparts of death? Thus we should not minimize the fact that before spiritual change was possible, a critical point was reached, a struggle had taken place, the anguish of dying to the illusory sustaining hopes of the world, after which Basil was able to embark on a comprehensive reorganization of his plans and priorities, a reconstruction of his life in light of a new allegiance. The life of St. Basil finds many parallels in the life of St. Gregory the Theologian (b. ca. 329/330), and this is not surprising, since they were friends, fellow countrymen, and members of the same social class. But whereas Basil was disinclined to publicize his personal experiences, Gregory is the first Church Father to have written an autobiography. During his retirement, Gregory wrote a lengthy poem reviewing his entire life, beginning with the events of his infancy and childhood. He describes the poem as “the history of his calamities,” and among the many vivid vignettes is the botched attempt to assassinate him when he was archbishop of Constantinople. Yet the principal crisis was surely the terrifying event that led to his conversion. I chose to leave Alexandria at a moment outside the sailing season, before the sea had settled down. This was an act of rashness and not good sense. I was making my way to Greece when the ship was struck by a squall. Everything became a great blackness; deafening thunderclaps resounded amidst flashes of lightning; the sails were in shreds, the mainmast was bent, and the rudder was useless, being torn forcibly from the helmsman’s hands. Mountainous seas swamped the vessel. A confused clamor arose, cries of sailors, officers, and passengers. And we were without water, since the moment the ship began to roll, the barrels containing that precious treasure were smashed and scattered to the depths. The sea continued to rage, and we were harassed for many days. The question was whether the sea, or the lack of water, would make an end of us. Driven this way and that, we had no notion of where we were sailing, and we could see no hope of being rescued by God. All of us feared a common death, but more terrifying for me was the hidden death, for those murderous waters were keeping me away from the purifying waters that divinize us. That was the cause of my lament and misfortune. For this I kept sending up cries and stretching out my hands, and my cries drowned out the pounding of the waves. My clothing was in tatters and I lay, miserable and prostrate, in the prow. There was not a shred of hope, no island, no mainland, no mountaintop on the horizon, no beacon light, no guiding star. What was I to do? Was there any way out of these dangers? Despairing of all hope here below, I turned to God, my life and my light, the source of terror and affliction but the gentle healer too, ever weaving good into the dark pattern. It was at that moment that I gave myself to God, and the sacred promises I made delivered me from the raging ocean. As soon as Gregory had finished praying, the winds ceased, the sea grew calm, the ship found itself on course, and in a short time he was in Athens. True to his promises, he “tore himself away from the spirit of the world”, and devoted the rest of his life to the service of the Church. If Basil had seen the wondrous light of the Gospel, Gregory experienced all the fury of the sea. It’s hard to imagine enduring even a few minutes of such overwhelming terror, yet Gregory was caught in the storm for an excruciating twenty days and nights. The real fear, however, was not the prospect of death by drowning, but the prospect of dying unbaptized. Like many fourth-century aristocrats, Gregory had postponed his baptism, and so along with his plans for the future, his eternal salvation was about to be destroyed. It’s probably safe to say that, while onboard the ship, he suffered some kind of breakdown, and his condition became so severe that the sailors found his cries more upsetting than the storm. The last of our Three Hierarchs, St. John Chrysostom, was born in the city of Antioch, sometime around the middle of the fourth century. Antioch is about two hundred miles to the south of Caesarea, and when Chrysostom was born, Basil and Gregory were young students memorizing passages from the Iliad. Like them, Chrysostom was born into a prominent Christian family, his father being the military governor of Antioch. Also like them, he had a keen mind, received the best education available, and was groomed to be a leading figure in the life of his native city. Here, however, the similarity seems to end, since Chrysostom does not seem to have experienced the kind of crisis and conversion that we saw in the other two hierarchs. The comparative stability of his early years; the absence of a disruptive, disorienting event, is probably due to the influence of his mother. When Chrysostom was still an infant, his father died, leaving his mother a widow at the age of twenty. Refusing to remarry, she became emotionally dependent on the child, who bore a strong likeness to her deceased husband. When John was still fairly young, she made him promise that he would not leave home until after she died. She took a strong interest in his education, and spared no expense in seeing that John would be raised as a gentleman. She did not permit him to go abroad for his studies, but placed him at the feet of the greatest teachers in Antioch (the “Athens of Syria”). Thus it was that Chrysostom became the student of Libaniοs, an upper class pagan rhetorician renowned throughout the Greek world. Among Libanios’ students were many distinguished men, yet it was the nimble-tongued John whom he designated as his successor. After he completed his studies, we know that Chrysostom pursued a career as a successful young lawyer. Despite the fact that his mother had pushed him into law school, there is no evidence that John was unhappy with his career. On the contrary, for a while he seems to have lived to the hilt the lifestyle of a rich young man enjoying his growing fame as a brilliant attorney. And lest we think this is mere rhetoric, it was widely believed throughout Antioch that Chrysostom had initially declined priestly ordination, not out of humility, but because he was prideful, arrogant, ambitious, and enamored of worldly glory. Needless to say, this is not the John Chrysostom we know, and thus some sort of change must have taken place prompting the young lawyer to abandon his career and place his talents in the service of the Church. It seems safe to say that beneath the surface, various cross pressures were at work, and the balance of John’s life would yet again be shifting. According to Archbishop Chrysostomos Papadopoulos: “It was at this time that John found himself confronting the problem that was his life, the solution to which was not going to come about easily.” So, on closer inspection, Chrysostom does seem to have passed through a kind of crisis, and eventually enacted a critical volte-face very similar to Basil. Another way to approach this question would be to look at what Chrysostom says about the different conversion experiences described in Scripture, especially the conversion of his great hero, St. Paul. Had we the time to consider this in detail, we would find that Chrysostom’s extraordinary interest in St. Paul was motivated by his ability to identify with the great Apostle, for just like himself, Paul was an educated lawyer with a delayed vocation. What we see in the lives of the Three Hierarchs is a basic element of the spiritual life: the experience of a crisis that leads to spiritual growth. This may be a dramatic, once-in-a-lifetime event; a disordering, disrupting experience that calls into question our taken-for-granted world, resulting in a change of values and interests. The specific form that such an experience takes will vary according to the circumstances of our lives. Not too many of us are at risk of shipwreck on the high seas, but there are other kinds of storms, such as a crisis in adolescence or mid-life; and there are other kinds of shipwrecks, such as the perception that one’s life is not what it should be, that one has reached a dead end, is trapped in a pattern of self-destructive behavior, and that some sort of change is necessary. In addition to these extraordinary, once-in-a-lifetime experiences, there’s also a sense in which every moment of life is a kind of crisis, or at least has the potential to be one, in the sense of being a turning point in which we are called on to make a critical choice. xxvii In his Letter to the Young, On How they Might Derive Profit from Greek Literature, St. Basil compares this situation to the famous story of “Herakles standing at the Crossroads”: one road leads to virtue, the other to vice, and Herakles must decide which way to go. And this, Basil says, is an image of each and every one of us, since we are called on continually to make a choice between God and the selfish desires of our ego. In this way, Basil aligns Greek letters with the spirit of Christ, who said: “If any man would come after me, let him deny himself, and take up his cross every day and follow me, for whoever would save his life will lose it; and whoever loses his life for my sake, he will save it” (Lk 9:23-24). This means that in order to follow Christ, we must experience a kind of death. For something new to be born, something old has to die, but no one dies right away; it takes a long time to die, and so our whole life should be an ongoing conversion, an ongoing taking up of the cross, an ongoing surrender to God. We often think that God is going to come into our life by means of some pleasant experience that will require little or no change on our part. However, God is more likely to enter our lives through a crisis, like a serious illness, or some other affliction, for these are the signs, not of God’s absence but of His active presence. As we saw in the lives of the Three Hierarchs, God comes to us in the eye of the storm, in the midst of our difficulties, in the midst of our confusion, our pain, and our suffering. Recall the words of Gregory, who learned by experience that God is both “the source of affliction” and “the gentle healer.” Affliction alone can tear us away from our isolated, individual existence and transform us into something much more whole and open. The self-consoling dreams and delusions of the ego make it hard for us to perceive the reality of God. But when all the illusions are swept away by some affliction, then I begin to call and cry out to God, like the psalmist who said: “In my affliction I cried out to the Lord, and He heard me” (Ps 18:5). We see this very clearly in the case of St. Gregory: Gregory’s life was changed not by any mystical experience, not by any sublime meditation on the nature of reality, but because he confronted his death. For twenty days and nights, Gregory sat face to face with the prospect of his own annihilation. During that time he was forced to think of himself as non-existent, to see himself as dead already, and with the image of himself completely wiped out, he was able to see what was left without him. And what was left was everything else, all that was not himself, which he had never before seen and which now opened itself up to him and filled him to overflowing, so that through death he found life, and discovered that with the death of the self all things become the object of God’s perfect love. So the crisis that engulfs me, the pain that I feel, is a kind of birth pang, for it is the initial movement of my soul longing to be united to God. And my longing for God is met by God’s longing for me, for it is God Who is seeking me in and through my sufferings, so that, in the end, a spiritual crisis is not the agony of man struggling to find God, but the agony of God struggling to find man. And so the pain that I feel is the pain of God searching for those who are lost, running after those that are far away, and until they are found and in His embrace, God will be in agony. Another common element in the lives of the Three Hierarchs is their response to the crisis that brought God into their lives. In the wake of that experience, each of them was overcome by the desire to flee from the world and live exclusively with God. And so each of them spent a period of time in the desert, in the wilderness, in some kind of monastic retreat. Yet what’s so fascinating about the Three Hierarchs is that they didn’t remain in the desert. At a critical point, God called them back to the world in order to serve the Church. Consequently their flight to the desert is only part of the story, being a transitional stage in their journey back to community. The pattern is well known. Christ retreated into the desert for forty days, after which he returned to the world to embark on His public ministry. St. Paul also spent a period of time in the desert, before beginning his apostolic work (cf. Gal 1:17-18; 2:1; 2 Cor 12:2). This pattern, with its crucial middle stage of flight and exile, has all the marks of a classic rite of passage, in which one is segregated from society before returning to it, armed with new knowledge and better prepared to rejoin the life of the community. This is an ancient practice, and was very much part of the cultural world of the Three Hierarchs. Since St. Basil has taught us to “derive profit from Greek literature,” we might profitably illustrate this practice by turning to what is surely Plato’s most famous dialogue. Most of Plato’s dialogues are carefully constructed, beginning with the first word. One of these dialogues is the Republic, the first word of which is «κατέβην» (“I went down”) which is to be understood in various ways: the “going down from Athens to Piraeus” with which the dialogue begins; the going down from the exterior world of so-called reality to an interior world of transformation; ultimately it is the going down into death, in order to learn if death is the end of mortality or a way to immortality. The movement culminates in the “Myth of the Cave,” in the going down into that cave with the intention to rise from it. The dialogue closes with the vision of “Judgment in the Underworld,” from which one returns bearing an important message – what Socrates calls the “saving tale, that must be brought back from that other world,” making the one who returns from such a “crisis” (κρίσις /crisis) a “messenger to mankind.” Thus, the Republic does not give us a simple story of linear progress, but a dramatic construction of departure and return, and this is the existential core around which the dialogue is built, and which in a Christian context was enacted by the Three Hierarchs. However, leaving the desert did not mean leaving behind the lessons of the desert. And so what we see in the Three Hierarchs is a synthesis of monastic ideals and practice with active service to the Church. Gregory articulates this very clearly in his Funeral Oration for Basil. Far from being opposed to the active life of pastoral care, the life of prayer and contemplation is a requirement for effective priestly service. To accept a position of priestly authority without the lessons of the desert is both foolish and dangerous, and thus the active life of love and service must be complemented by the life of prayer and contemplation. According to Gregory, the bishop is someone who joins to his performance of episcopal duties a commitment to ascetic ideals, two modes of life that Gregory saw united in Basil, whose experience of God in the desert was the source and foundation of his entire ministry. Every crisis is an opportunity for spiritual growth, and it was the experience of crisis and conversion that enabled the Three Hierarchs to become instruments of God’s grace. In finding God, in allowing God to find them, they found themselves. In finding their own voice, we find in them a universal voice. In fulfilling the task of their own time, they produced work valid for all time, and though they lived more than a thousand years ago, we continue to honor their life and work. But in the midst of our celebrations, we ought not to forget the words of St. John Chrysostom: «ἡ τιμή τοῦ ἁγίου εἶναι ἡ μίμησις τοῦ ἁγίου» . God speaks to all of us, but we don’t always listen, and if we do listen we don’t always do what He says, or if we do, we get tired easily and give up. But the Three Hierarchs, like all the saints, heard, acted, and never wavered in their resolution to live for God. And in giving their lives to God, they lost nothing; on the contrary, in losing their life they found it (cf. Mt 10:39), and whatever they gave to God was returned to them a hundredfold and they have inherited eternal life (cf. Mt 19:29).